This unusual collection explores the development of ideas in psychology's past, and shapes them into a valuable resource for ideas in the discipline's future, with particular emphasis on holistic traditions in psychology. Diriwochter and Valsiner focus on developmental holistic psychology as advocated by the second school of Leipzig in Germany. Although largely neglected, this school of thought has provided some of the fundamental ideas necessary for a truly holistic approach in psychology. This volume includes Leibniz's dynamic holism and Ehrenfels' discussion about Gestalt qualities, which has generally been acknowledged as a major milestone in the formation of Gestalt psychology. Each chapter looks at the possible future of holistic psychology. 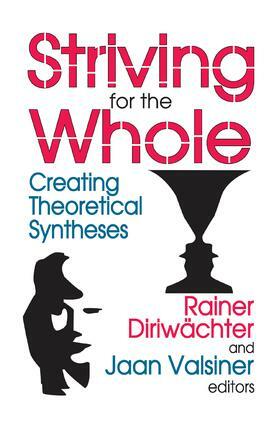 Striving for the Whole contains several well-though out discussions on possible elaborations of holistic psychology by contrasting it with Ernst Boesch's cultural psychology, Pierre Janet's theory on emotions, and Jan Smuts holistic approach to personality theory. Discussions of holistic approaches in biology and evolutionary psychology, as well as a renewed look at Lloyd Morgan's comparative methodology, complete the volume. Striving for the Whole has been written by an international group of authors and will be of interest to students of the social sciences and intellectual history, and anyone who wants to dive deeper into holistic approaches that maintain their ties with empirical methodology. It is ideal for graduate and upper-level undergraduate courses in psychology.